When I decided I was going full-time with this animation thing and Paper Brain about 4 years ago, I drafted an animator’s bucket list in my head… and one of the big points on the list was to make an animation for Sesame Street. 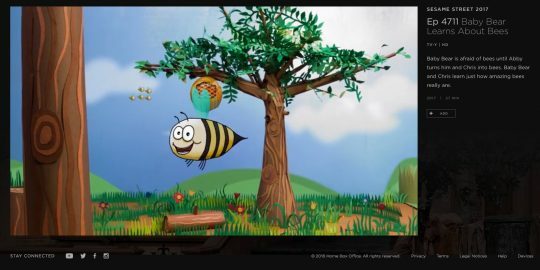 I’m proud to say we’ve gotten to make two animated films for them now, and one of them is on the most recent episode that just aired on HBO called Baby Bear Learns About Bees. I co-animated this one with Jared Hedges, who I’ve really enjoyed working with on several projects since our introduction as animators for Gortimer Gibbon’s Life on Normal Street. Lisa Ray was lead fabricator, making the massive paper mache beehive and all the lovely paper flowers that bloom at the end. The adorable voice narrating was Terance Rylander, who is such a sweet kid I’m always looking for more ways we can work together again. And the music was scored by the super chill Gregory Pepper, one of the coolest things Canada ever made (even better than their bacon). So… I’m really excited to share this… it plays about 20 minutes into the episode (with the 6 bees, as seen in the photo). I can’t wait until Paper Brain’s other Sesame film “S is for Seasons” airs in the near future.